Nvidia were the first to do it, and it's surprising that more companies have yet to follow suit; unified drivers save time, and from the users perspective they can save a lot of hassle. SiS have implemented, and updated their unified driver architecture for the Xabre600 videocard, calling it "Xminator-II." Xminator-II offers more user control, and packs in all of the so-called Xmart Technologies (pronounced Smart Technologies, since "X" sounds like "S" in many languages). It may not be the most accurate way of testing the compatibility of unified drivers, but in switching between the Xabre600 to the ECS AG400 (Xabre400) we had no difficulties. The drivers picked up the card and installed the required drivers without needing to pop open the CDROM. It seems like SiS has got their driver act together very well. During benchmarking we didn't experience any abnormalities like we did when we tested ECS's AG400 (Xabre400) based videocard. 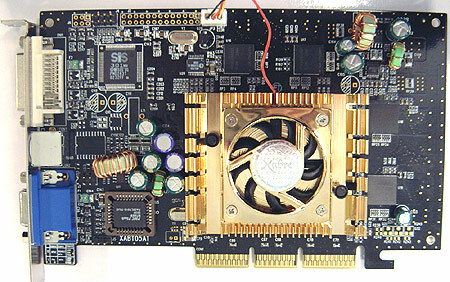 The reference Xabre600 videocard uses a jet black PCB (which looks great) and gold coloured heatsink. It has 64MB of Hynix BGA DDR RAM which has a 2.8 ns rating. Even though the reference card has both analog and DVI output, it does not support dual monitors. The card also has TV-Output but we're not going to dwell too much on the features of the reference card, because it'll be up to the manufacturer to implement them, and the features will vary. On a side note, both the core and memory of the card we tested were clocked at 314/314 MHz by default, up from the specified 300/300 MHz. Using the in-driver overclocker program the core and memory speeds are in sync by default. Thus, all the overclocked benchmarks we show here were run with the core and memory in sync (same speeds). The Xabre600 we tested came with a nice shiny active heatsink, but no thermal paste between the core and GPU. Before beginning, we applied some standard white silicon thermal compound to the heatsink. Built with a 0.13 micron manufacturing process, we were hoping the Xabre600 core would overclock well. We began to raise both the core and memory slowly at first, but anything speeds higher then 328 MHz would generate some pretty serious artifacting. With some further testing I found the memory capable of reaching 350 MHz very easily, but no matter what we tried the core would not budge above 328 MHz. On a side note, the Xabre600 reference card seemed to like the memory frequency and core speeds in sync. If either the core or memory was overclocked independently it didn't really boost performance by any significant degree. In any case, on with the benchmarks, and to start off let's look at Madonions 3DMark2001!